Oh hair accessories, how you tempt me. 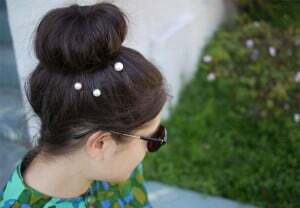 In an attempt to bling my short hair I cannot resist a good bobby pin or barrette DIY. 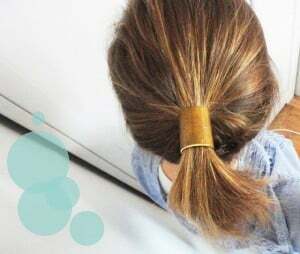 Since I’m also a bit of an information hoarder (like with these 25 homemade beauty recipes) I’ve captured 25 easy DIY hair accessories. 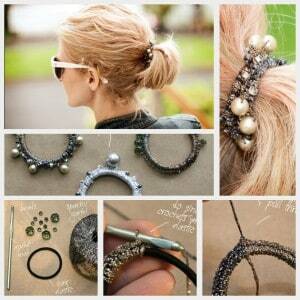 Dressed up hair is hot for fall so get busy DIYing. :) Let me know your favorite! 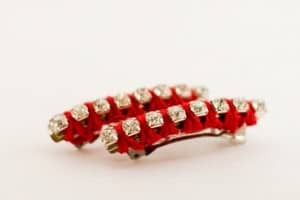 The rhinestones add lots of sparkle, while the barrettes make sure that your hair stays in place. 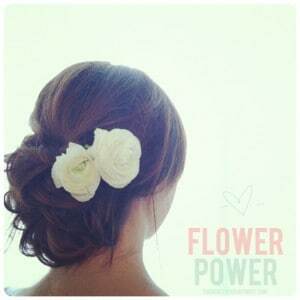 Gorgeous trick for wearing real flowers. Can’t you see wearing this for a fancy garden party? 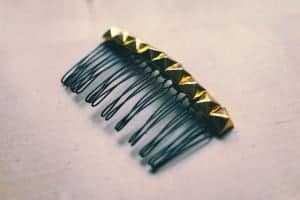 Add some edge to your ‘do with studs and a hair comb. Wow, now this is a statement piece! 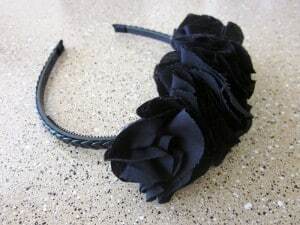 You basically just glue plastic flowers to a headband, but the result is spectacular! 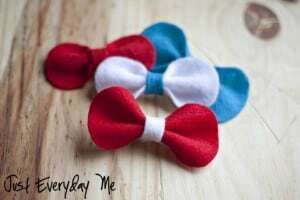 You can use the wire bow for braids, pony tails or buns. And you can make it in less than 15 minutes! 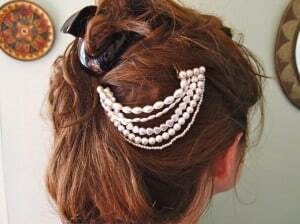 This super special pearl hair accessory might take a while to make, but the result is worth it! Plus, it gives you something to do with all those beads you collected. 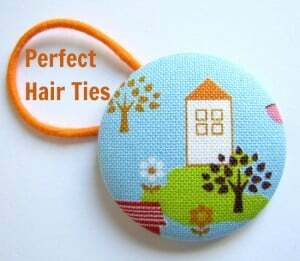 These lovely hair elastics add a high-fashion touch to a basic pony tail. Now this one is cute! 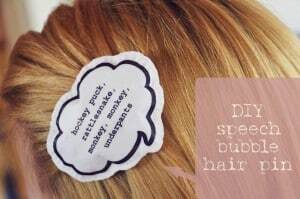 Make a speech bubble with your favorite quote and wear it in your hair. 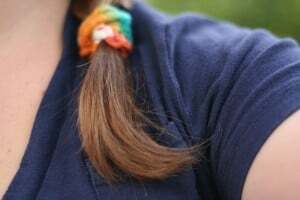 If you have a button making kit, then it’s super easy to make these pretty hair ties. The kids would love them. 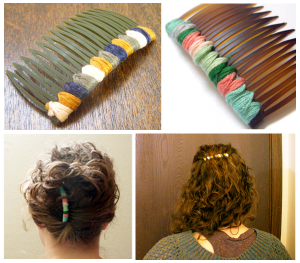 Katie’s wrapped hair comb is the prettiest – and easiest – thing I’ve seen in ages! Probably as chic as a LBD, this velvet headband was inspired by the one Michelle Williams wore at the Golden Globes this year. 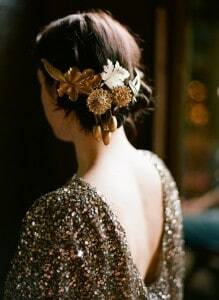 I’m so smitten with this gorgeous use of brooches. Can I have another wedding just to wear these in my hair? 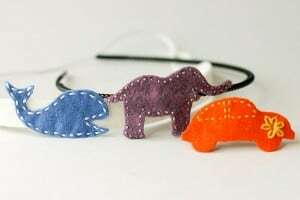 Here’s something to make for your stylish daughter: these felt headbands with fun and fuzzy felt animals. Chanel really knows how to use pearls in the best ways possible… And now we do to: we wire them to hair pins. I didn’t think about this before, but you can totally paint acrylic craft stars in a trendy metallic or neon color! 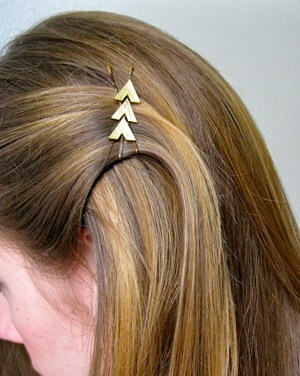 And then you can make them into pretty hair clips. Super simple, but it looks super cool. The only thing you need: a plumbing ring! Oh, so cute! 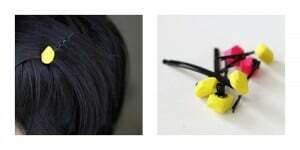 You just need small pieces of felt that you glue to hair pins – even the kids could make them. 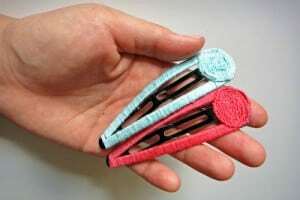 Give a new life to your old hair clips by wrapping them in thread. You can go wild with color. Love The Hunger Games? Then you’re gonna love this arrow pin. Haven’t seen it yet? You’re still gonna love this arrow pin. Why buy when you can DIY? 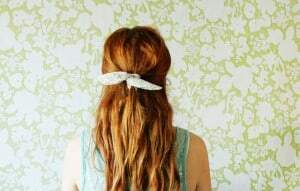 This ruffle headband looks adorable and you don’t need much money to make it yours. 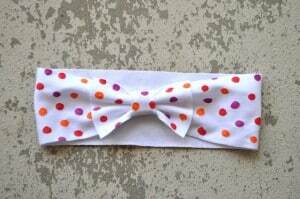 In a matter of minutes, your kiddo can have a new pretty headband. With no sewing required! I love how fashionable these are! 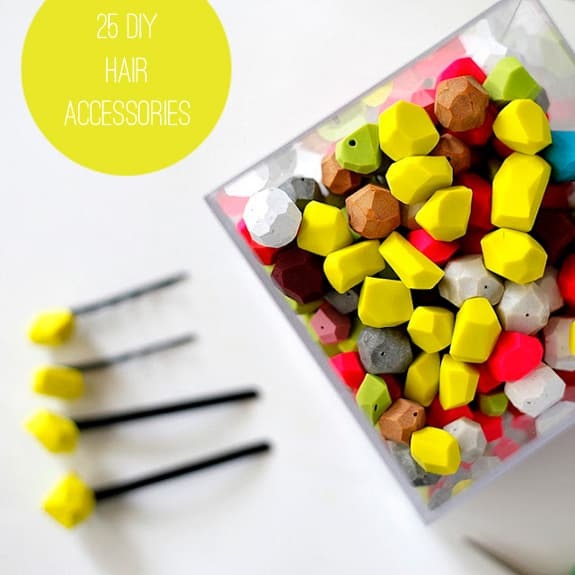 And all you have to do is glue clay beads to bobby pins. How many mismatched buttons do you have lying around the house? 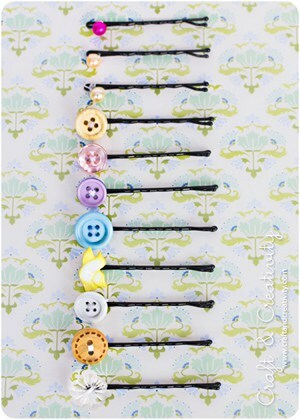 Use some of them to make cute bobby pins for yourself or to give as gifts. 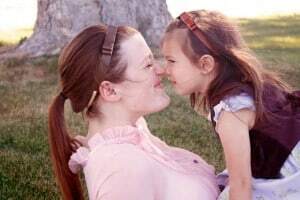 Matching headbands is pretty much the cutest thing ever… Make some for you and your daughter out of recycled leather. I really love the felt headbands, so simple and super cute. You could make any shape to match so many outfits. Great Post! I can’t be aware that generate income found themselves listed here, nevertheless i imagined this publish was previously excellent. I don’t recognize that you may be and surely you’re going to some sort of renowned doodlekit cleaning soap will not be by now. All the best! Of course! Go for it Amy! I have try some of them, and I looks great! When I first saw that bowl of clay beads Stephanie, I thought it was candy! LOL What a collection of great ideas. 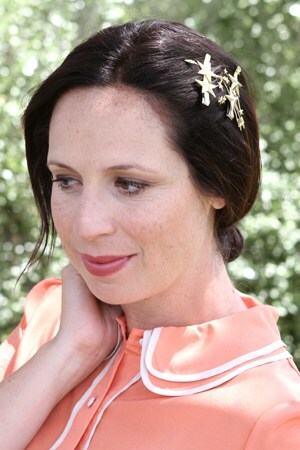 I love the jewelled hair ties and can’t wait to wear some of my grandmother’s vintage brooches in my hair. How lovely! Love the pop of color! Perfection. That one is dreamy for sure! Awesome! Pinned a few, can’t wait to try!! Thank you for sharing such cute stuff!